Tribal Council last week ap-proved a request from the Kah- Nee-Ta board to proceed with a lease agreement with the new in-vestment partner, AV Northwest. AV Northwest will manage the resort operation and make sub-stantial investment, perhaps $16 million, for improvements at the property. “Tribal Council is supportive, realizing our limited options for making Kah-Nee-Ta competitive in the Central Oregon market,” said board chairman Jim Manion. Kah-Nee-Ta had been facing the possibility of closure at the end of this year. The new agreement is the best way to make the resort again a viable enterprise, the board and Council agreed. Facing possible closure of Kah- Nee-Ta, the board early this year reached out to AV Northwest. Through negotiation over the months the parties reached terms calling for a lease of 25 years. During that time the manage-ment of the resort would be un-der AV Northwest. The tribes would receive compensation through the room tax. 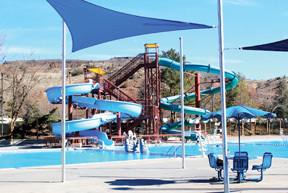 The list of needed improve-ments at Kah-Nee-Ta, as outlined by AV Northwest, is extensive: A new heating and cooling system, new paint, improvements to the rooms, pools, restaurant and café, to name just a few. An intriguing aspect of the plan is a new hydro- and physical therapy center at the Kah-Nee- Ta Village. The hot springs would be put to use in the treatment of young people who are recover-ing from muscular and other con-ditions.